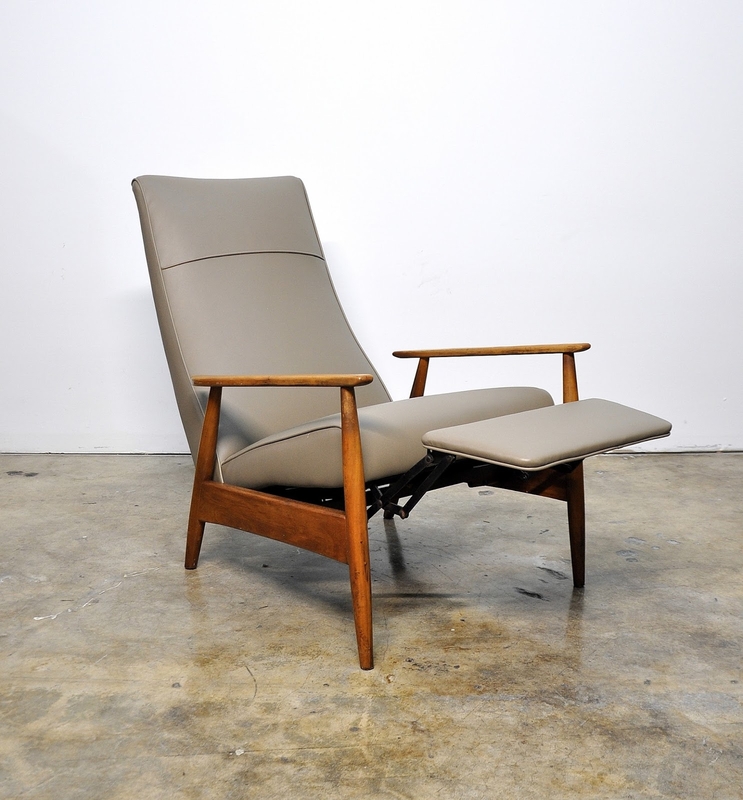 The Milo Baughman Recliner 74 is yet another alluring piece of furniture designed by Milo Baughman, one of the most accomplished and prominent figures of 20th century American furniture design, whose innovative body of work was acclaimed by The New York Times as "elegant and fresh" and "strong and greatly sophisticated". The chair was designed by Milo Baughman for James Inc., a furniture company established by Thayer Coggin. The collaboration between the two men dates back to 1953, when Baughman would travelled to High Point in North Carolina, known as the national center of furniture manufacturing, in an attempt to draw manufacturers’ attention to his modern and innovative designs. Reportedly, all the major furniture producers turned him down. His last meeting was with Coggin, a furniture maker seeking a designer for his future products. Baughman later recalled that: “For about an hour, I showed him my designs. Thayer suddenly stood up and said, ‘This isn't like anything I have ever seen before, but I like it. Let's do it.’”. The collaboration between Milo and Thayer lasted for nearly five decades, until Baughman’s death in 2003 and resulted in a multitude of astonishing designs, including the Recliner 74 Chair. It was first introduced in 1966 and was manufactured until 1971. The Milo Baughman Recliner 74 was brought back to life by the Thayer Coggin Inc. furniture company, which launched the chair back into production, making it again commercially available. "Furniture that is too obviously designed is very interesting, but too often belongs only in museums." This quote by Milo Baughman perfectly depicts his approach to the furniture design. In Baughman's distinguished body of work, his ample creativity never interfered with functionality, instead he reached an ideal modernist balance. His designs were defined by the idea of making timeless, universal objects that would resist the passage of time. The concept of making very simple and fully functional, yet elegant and stylish objects has been present in the design of the Recliner 74 from the very beginning. The chair’s design combines simplicity with comfort. The most distinctive part of the chair is its reclining seat, hence its name – ‘Recliner’, which leans back at the whim of its user. The long back rest provides excellent support and gives the chair its regal, throne look. The angle between the back rest and the seat pan does not change, the seat leans back as a whole. In order to provide the absolute heights of comfort and relaxation, the retractable foot rest protrudes from under the chair. Both the seat pan and the back rest consist of the plywood cores, layered with the foam and fiber cushions on top. Although the chair was originally available upholstered in fabric, today customers can choose from a wide range of weaves and leathers in order to create their personalized variation of this modern design classic. One of the most remarkable upholstery options is Ducale Wool, which at first glance looks like a plain, monochrome fabric. However, upon closer inspection, it reveals hints of lighter hues within its weave, blended together to create depth and warmth in one, outstanding textile. The chair is supported on the four-legged base manufactured from the walnut wood. The legs are cylindrical and tapered down at the both ends. They also serve as a support for the bent walnut armrests. The Milo Baughman Recliner 74 Chair is a perfect combination of an astonishing form and exceptional functionality. This remarkable piece of furniture still looks fresh and appealing, making it a great, tasteful addition to any modern interior. According to Dot Coggin, Thayer’s wife and spokeswoman for the Thayer Coggin Inc. furniture company, the cooperation between her husband and Baughman was sealed with a handshake: "Milo came here when the company was in its organizational stage. Thayer was looking for a designer and their relationship began with a handshake agreement." It should not come as a surprise that Milo Baughman and Thayer Coggin were extremely passionate about furniture. However it becomes even more evident when looking at their biographies. Milo’s adventure with the furniture design started early in his teenage years and was present is his life ever since. At the age of 13, he was assigned the task of designing both the interior and exterior of his family's new house in California. Following high school, he served for four years in the Army Air Forces during World War II, at that time he was participating in designing officer's clubs. In the case of Thayer, his love for furniture began on one Christmas Day, when a claw hammer was at the top position on his wish list for Santa. After receiving it, Thayer started tinkering with wood. A few years later, while attending shop class at High Point High School, he started manufacturing his first rocking chairs and cedar chests for sale, trying to save money for the tuition fee at the High Point College (now High Point University).